Villa Blue Rose one of the best Villa in Bali. 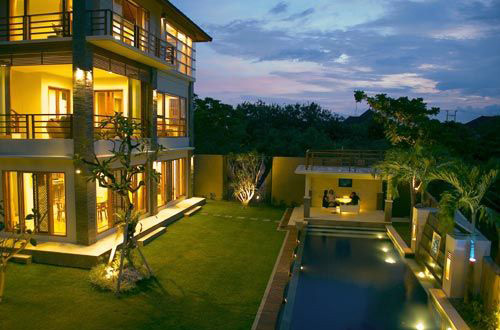 This boutique estate combines contemporary luxury with traditional Balinese hospitality and service. Blue Rose Villa present a 180 degrees spectacular views looking west over the Indian Ocean on an unspoiled cliff side location on the Bukit Peninsula, near Uluwatu in South Bali. Sunset view is being particularly special. The concept is both simple and flexible. For relaxing holidays BRV offers plenty of opportunities to chill out poolside or to sit on the balconies enjoying the views. Alternatively, stroll around the country paths and lanes or drive a few minutes to nearby cove-type beaches where surfers catch reef breaks, swimmers splash in shallow waters and sunbathers snooze the day away. Blue Rose Villa is standing proudly on The Bukit Peninsula; selected and the most prestigious hoteliers because of its magnificent cliff views and calmness. Apart from the world class surf locations there are golf, water sports and paint-ball options for the more active. Joggers can delight in a gentle run around the nearby headlands or a more demanding 12km round trip from the villa. Spa experiences can be easily organized to fix the desire of relaxation in mind. Just 10minutes away, the famous Uluwatu temple is perched on a spectacular cliff face - a must see during your stay. Villa Blue Rose 2 storey has 3 bedrooms to accommodate 6 persons, where 2 bedrooms are on the ground floor and 1 Bedroom on the 2nd.floor. All bedrooms have an en-suite bathroom, safety box, air-conditioning, 26 LCD TV with cable and intercom. On the 2nd floor, an open plan living and dining room, including a fully fitted and equipped kitchen, 32inc LCD TV with cable, over looking the ocean with spectacular sunset and Jimbaran bay view. Villa Blue Rose 3 storey has 3 bedrooms to accommodate 6 persons, where 2 bedrooms are on the ground floor: An open plan living, dining, fully fitted and equipped kitchen, 42inc LCD TV with cable, intercom over looking the garden, swimming pool and the ocean. On the 2nd floor there are 2 bedrooms (shared bathroom), 26inc LCD TV with cable, air-conditioning and intercom in each room. Open sitting area over looking the ocean with spectacular sunset view. On the 3rd floor there is a Master bedroom with en-suite bathroom, 32inc LCD TV with cable, air-conditioning, intercom and a private living area over looking the ocean with spectacular sunset and Jimbaran bay view. It is well realized that delicious food is one of the essential parts of any great holiday experience. Therefore, Villa Blue Rose will provide for you daily breakfast. Villa Blue Rose can also arrange for delivery of the mouth watering local food or alternatively help you use the Weber BBQ for a succulent steak. Many people love to try the seafood on the beach, Italian restaurants or treat themselves at the 5 star hotels in Jimbaran approximately 20minutes away - or the chic bars and grills of Seminyak, approximately 60mins away. Villa Blue Rose is highly committed to maximize the pleasure and memories you take home from this paradise island-Bali.